Location Ambiance & Service: Fort has been my 2nd home since internship time back in 2014. This place houses an old school restaurant which is worth exploring. During my work time, I managed to explore a lot of those places but its not an exhaustive list for sure. Spices & Flavours have been in my radar since long and I got an opportunity this late to actually visit and taste the cuisines served in here. This generation has been greatly fond of cuisines like Italian, Continental and the middle east, but one would surely agree that at the end of the day one cannot just keep themselves unbound from the Indian style of preparations. 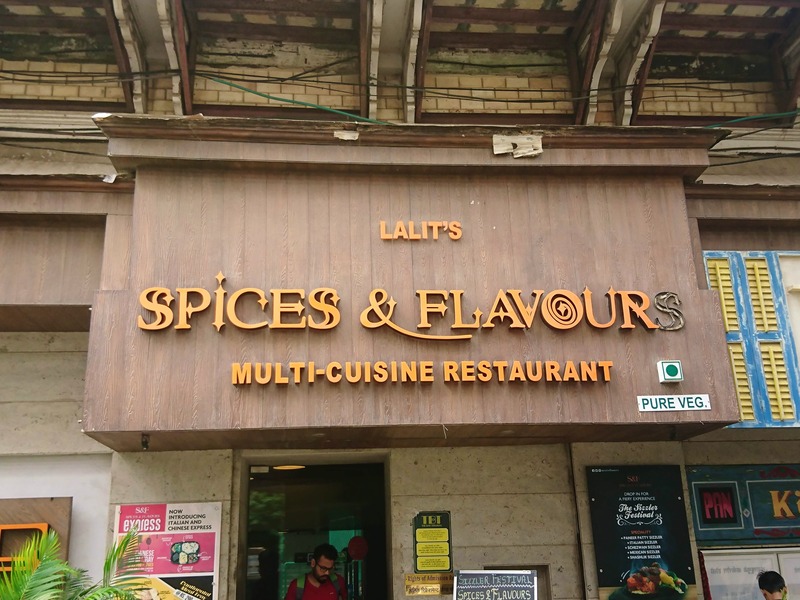 Spices & Flavours certainly are in a race to create a more fusion-centric preparation of traditional north Indian food without letting the dish loose the traditional taste and roots from which it has emerged. The presentation was very good and most of the dishes will surely rank top amongst the unexplored category of food. A very typical of Indian ambience yet the crowd imbibing professional etiquettes level at par with the Japanese is very much appreciated and we were probably the loudest amongst all. The preparation here is the brainchild of Vikas Dobhal, the main chef here and has brought something different to the table. Starters & Mocktails: Bull Frog:- How much does one really serve the quantity when it comes to mocktails? This was probably 2x to what normally is served at the same time ensuring there is no dip in quality. I would say, though not experienced, this was the closest to what cocktail would taste like, yet no spirit mixed to it. Probably the reason for the same is a mixture of red bull. So if you don't want to drink, yet you wanna drink, go for this one! Highly recommended! Raspberry apple cruncher:- The safest of all options and a family mocktail is what I would call this. Don't want to try something fancy yet get the invigorating feeling, this one does the job. Quantity? All served in the same glass. Bharwa paneer:- This place is a paneer haven, to say the least. Apart from the normal menu listing paneer their a separate column for listing paneer dishes which is over and above the normal. Bharwa paneer is a more advanced version of traditional tandoor paneer starter with chopped vegetables including exotic ones is stuffed inside it. No brainer. Highly recommended! Zucchini & Brocolli Tarts:- Don't like chopped pieces of zucchini or broccoli yet want to taste it? Tarts and croquettes are the best style of preparation to taste something you don't prefer to eat normally like you eat chopped onions. The tarts could have been a bit softer and might have been overheated. Worth going for if you want to taste the continental preparation after an overdose of north Indian preparation. Paneer Satay: A let down considering it is one of the most selling or signature dish. Probably the expectation was too high. But when you compare it with the order preparation we got to taste, this is fighting for the lower spots. Can be tried if your fond of skewers. Summer veggie roll:- The normal roll or spring roll as it is called in India but with a more sophisticated preparation. The main idea behind this is the vegetables used are exotic and are stuffed inside the roll served with an amazing green chutney. Main course & Dessert: Indian starters, unlike many other cuisines, are very heavy so its normal to have less appetite for the main course and that is becoming the culture amongst youth Butter Garlic Naan with Turesh E Paneer:- Has to be the signature paneer main course preparation by a mile. Three different types of gravy are used and are presented separately inside the same plate. The outer layer is the orangish gravy which is mild spicier and the in-between layer is the red gravy which is the typical Punjabi preparation. The paneer is in the centre and topped with white malai paneer gravy and served. Great presentation and taste. Highly recommended! Gulab Jamun Lasagne:- If you don't end your lunch/dinner with desserts over here, it would be a SIN! There are three layers of sweet used in this complex preparation. The bottom-most layer is sliced warm gulab jamun, the middle layer is hot motichur laddoo pearls and its topped with or layered with cold rabdi like a lasagne. Amazing, Beautiful and highly recommended!